Some of the most frequently asked questions that come my way are about the care of citrus – mainly about pruning and pests and diseases. Regular maintenance will go a long way to controlling common problems. 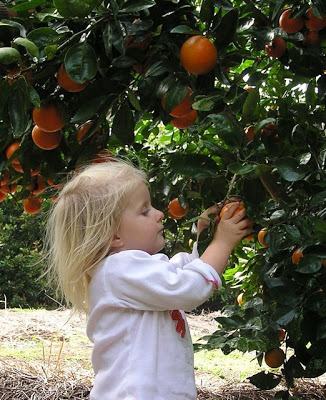 PLANTING: We are at the start of citrus season and just about every variety imaginable grows in my area – but to have healthy, productive trees a few simple guidelines should be followed. FEEDING: If you feed your citrus regularly they will be healthier, more resistant to pest and disease attack and bear more fruit. 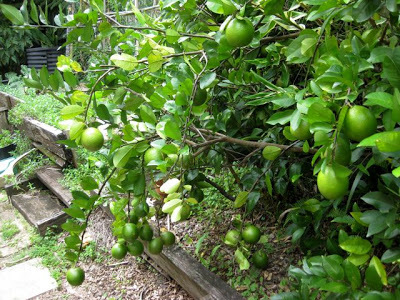 Citrus trees are very hungry feeders with high requirements. A regular foliar spray (liquid fertiliser applied directly to the leaves) with a seaweed based fertiliser will go a long way to providing the essential macronutrients of nitrogen, phosphorus and potassium + trace elements. SEE Making Your Own COMPOST TEA. 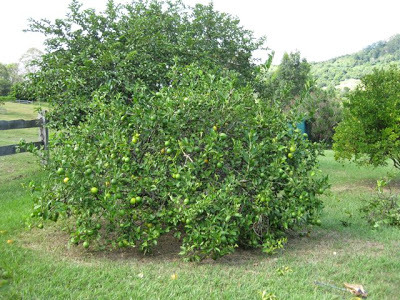 Citrus will also benefit from a tri-annual complete soil fertiliser in September, early December and March – after the rainy season; always water the tree well after fertilising. Never place non liquid fertiliser close to the trunk or in heaps, spread it as evenly as possible to just past the drip-line of the tree. Compost or animal manures are ideal. For details on when and what to feed citrus go to this link and how to recognise deficiencies. My lemonade tree after feeding it for a year – it’s worth it! WATERING: Citrus are thirsty plants. 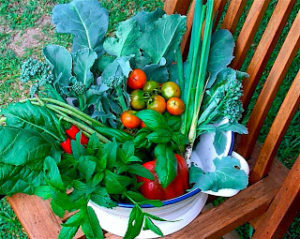 If you neglect to water them during dry periods the fruit will also be dry. Continual water stress leaves the tree weakened and less productive. Citrus need regular watering from flower bud formation through to fruit set to retain a good crop. Water stress is usually the cause of fruit drop. Mulching will alleviate this. 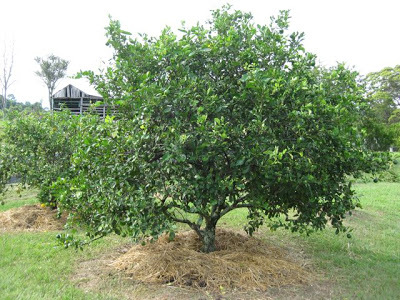 MULCHING: Do not plant citrus (or any tree) in the middle of a lawn without having a grass-free mulched area out to the edge of the canopy. Grass around trees also equals the dreaded whipper-snipper! I have seen more young trees damaged and ring-barked by thoughtless ‘whipping’ than I have had hot dinners! Wet newspaper, at least 10 sheets thick, can be used to kill weeds and grass under the tree and then topped with mulch regularly to prevent weeds returning. Always mulch past the drip-line of the tree as this is the area where most of the feeder roots are found. TOP TIP: A lot of folk have problems with brush turkeys and say that they are reluctant to mulch under trees for this reason – the critters just dig it up. A way to overcome this is by planting a green manure crop in the mulch (they put back into the soil as well as anchoring the mulch) with something like nasturtium – non-invasive, hardy and very pretty. Before pruning and mulching – note dry, cracked soil under tree and branches dragging on ground. After. Branches pruned away from ground and mulched out to drip line. This is the ideal height to keep a citrus tree. Prune in June or July before the spring bud burst in frost-free areas. In frost affected areas delay pruning until after the last frost. Remove dead or damaged branches, branches growing inwards and very low branches to improve air circulation. LIFT THE SKIRT. After pruning, the lower edge of the canopy should be 60 – 90 cm clear of the ground. Shape the tree after harvest in early spring. 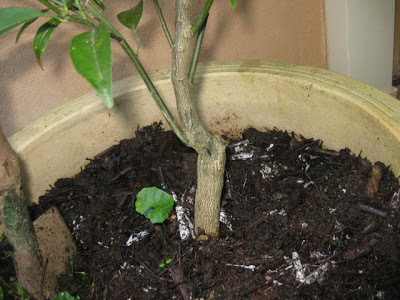 A NOTE ABOUT CITRUS GRAFTING: All citrus that you buy have been grafted. This means that two different species of citrus have been ‘cleft’ together to make one plant. Generally the ‘rootstock’ is Citrus trifoliate (meaning-three-leaves) and is used because it is resistant to a soil born disease called phytophtera which, in the past just about wiped out the world-wide citrus industry. The ‘scion’ or main plant on the top is the desirable species be it Seville orange, Eureka lemon, Tahitian lime etc. If you look carefully at a citrus plant you can always see where it has been grafted – it’s where the ‘dog-leg’ is! The photo on the left shows unwanted shoots of trifoliate which grew below the graft of my lemon tree- TAKE THEM OFF! Most citrus will throw out a few of these unwanted shoots. 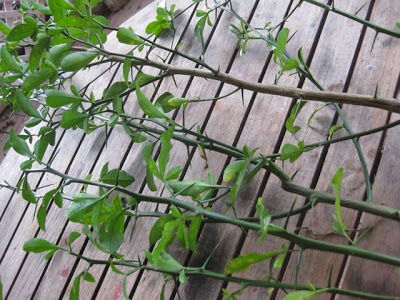 A regular part of pruning maintenance is to remove shoots of trifoliata from below the graft as soon as possible, as they steal vigour from the tree and, if left too long, leave large wounds for disease to enter when they are cut. They are viciously thorny so be wary handling them! Aim to have mature trees no more than 2.5 to 3 m high. Higher than this just creates problems with harvesting and pest control. Larger trees are not more productive than smaller, well-managed trees. Once you have taken all unwanted branches you do not have to be too fussy about trimming the outer growth – most citrus growers just take a pair of shears to their trees! 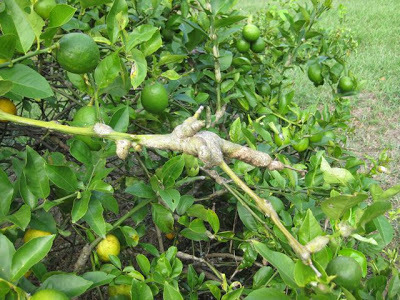 A NOTE ABOUT WASP GALL DAMAGE: You may notice these swollen lumps on citrus branches – make sure you prune these and destroy them. This is the damage that the burrowing wasp gall makes – if left, they will weaken the tree and eventually destroy it. Thank you – glad you find the information useful. I covered controlling citrus leaf miner in a previous post with a simple, effective oil spray – go to the search box at the top of the page – sorry, I can't link it here. Kindly, Diane. Great stuff Diane. One question…leaf miner… I have been picking off the affected leaves and spraying with a little detergent in water with some eucalyptus oil in the solution. Seems to be keeping on top of it, but would appreciate your feedback on this…thanks!